Packed with everything you need to know in order to pass the first time, including coverage of the 2009 International Plumbing Codes, over 300 visual references to show you how to use the illustrations found in your local code book to solve exam questions, and much, much more! Fully updated to reflect the 2009 International Plumbing Code, the 3rd Edition of Plumber’s Licensing Study Guide is a one-of-a-kind study tool that builds your skills, knowledge, and confidence with over 1500 multiple-choice and true/false questions with answers-all based on material most likely to be on your exam. Over 300 visual references showing how to use illustrations found in your local codebook to answer exam questions. Comprehensive coverage of all code topics. References updated to reflect the 2009 International Plumbing Code. 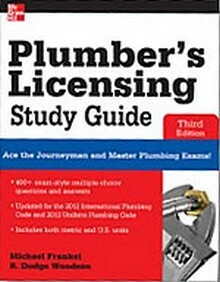 Plumbers Licensing Study Guide is a necessity for apprentices wishing to become journeyman plumbers and journeyman plumbers who wish to become master plumbers, this powerful, one-of-a-kind study tool builds your confidence, skills, and knowledge, and prepares you for the plumber’s examination, a necessary evil for advancement in the plumbing trade.